It’s been a rough couple of days. We had to send our sweet old boy Harley to Heaven this morning. He was 13 years old and had been suffering from a seizure disorder for the last 5 or so. The last few months it had gotten harder and harder for him to get around without help, and just in the last few days he declined pretty fast. I told myself when I started these blogs that only happy thoughts would be put out there to the world, so this evening , as I write this I would like to share with you a few things about him that I will fondly remember. Harley loved the water. 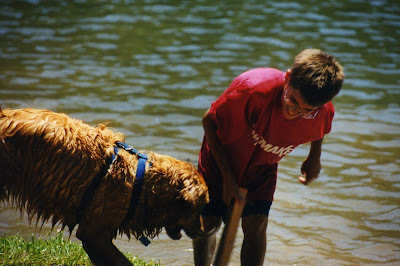 (Most Golden Retreivers do) We used to go camping in the summer and he would spend 75% of the trip wet and muddy, and loving every minute of it. 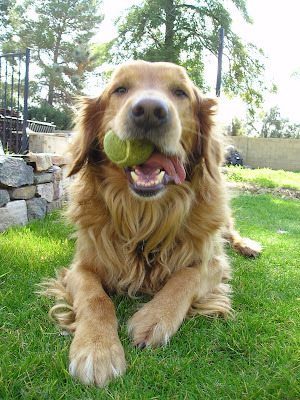 He loved to play ball when he was younger. He would play fetch for hours if we let him. 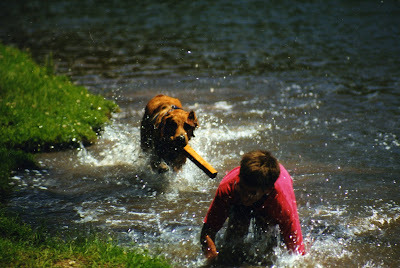 (We always gave up before he did) And if playing fetch involved swimming...even better!!! Harley was a wonderful big brother. 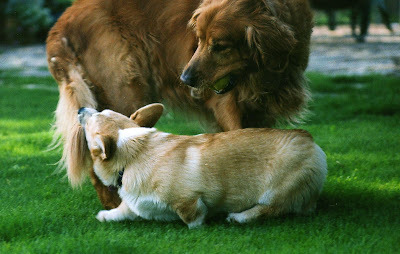 When we got little Jasmine, our Corgi, she would jump on him, pull his tail and ears... pretty much be a total pest. And he just took it. Never did he growl or snap at her. He just let her use him as a Jungle Jim. He even let her take his toys or steal food right out of his bowl!!! At night when my husband and I were sitting on the sofa, Harley would come up and press the top of his head against us as if to say..”hey, rub my neck please!” He would just stand there until we decided to stop, enjoying a little love from Mom and Dad. Have a good time playing ball in Heaven sweetie...We love you. Oh, I'm so sorry y'all lost your sweet puppy. It's just so heartbreaking to lose a furry family member. Hugs to you. I'm so sorry to hear about your sweet Harley. He sounds like he was a wonderful, sweet companion....and he looks like a real cutie too. Harley...so beautiful..It hurts so much to lose our fur babies. I like to think that those who have crossed that Rainbow Bridge are waiting for the sound of their master's voice in time to come...for a game of fetch. Take care. Karen, I am sorry to hear about your loss of Harley! He certainly was a beautiful boy. I heard something once that I hope is true...when you get to heaven the first things you see are all your pets waiting for you...can you just imagine how wonderful? I am so sorry for your loss. You have some wonderful memories of your beloved Harley. It is always so hard to lose a companion. When we lose one of our pets I always say no MORE! I just can't stand the sorrow but eventually they slowly fill our home again. So sorry to hear about Harley..... my little granddaughter lost her golden retriever Kasper last year and she was devastated. I scrap booked a memory album for her. They are such wonderful dogs, and such loving pets!!! Looks like your sweet dog was a real beautiful friend. I'm sorry to hear about your Harley, my heart truly goes out to you and your family. Your photos are beautiful and show how happy Harley was in all the love you gave to him. A beautiful home, love, pampering... what a fortunate dog that Harley! I'm so sorry for the loss. What a beautiful dog Harley was. Harley looks like a wonderful companion, and I am truly sorry for your loss. I am so very sorry for your loss! My doggies are my babies, too. I'm so glad I found you! You are right in my backyard and we haven't even met! I live in Ahwatukee! I am sure this is a rough time for you. Sorry to hear about your little doglet! 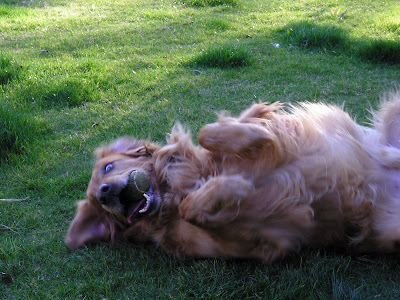 I'm so sorry that you lost your sweet Golden!! He looked so much like mine, I've gotta give Kodi and extra hug. 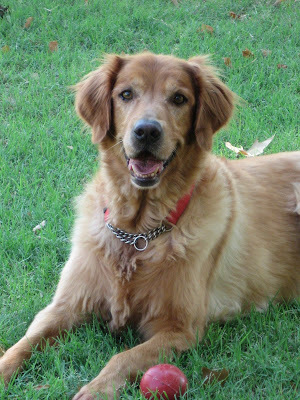 I'm saying a doggie prayer for Harley and my GF Kelly's dog Abbey, also a Golden that passed last week at 14. I'm sure they'll share the tennis balls up there!! Hugs to you and yours. I know, it hurts!! Such joy and life and love! Blessings to you as you cope with the loss of your sweet friend. You were a good family to be in, that shows through. Peace to you. I am just passing by, new again to blogspot. I am sorry about Harley, & know you all are sad. 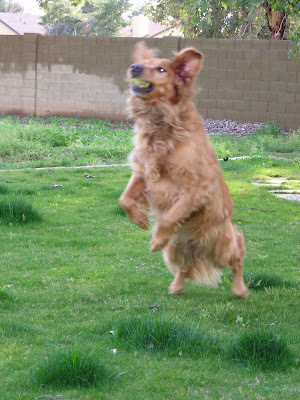 My older sister had to put her Golden Retrevor (Sophie Marie) down about a month ago. She was 15 & such a joy. When I would come to visit my sister would tell her I was coming and she would be waiting at the front door. She was oringinally gotten to aid my nephew (Josh)who suffered from MD. He passed in `97 at the age of 15. & Sophie went through many sad days, but she soon overcame it & was a true member of the family. My sister took this very hard. She had her cremated & keeps her close by. I really like your blog & i'll keep you all in my prayers. So sorry to hear about your sweet Harley. 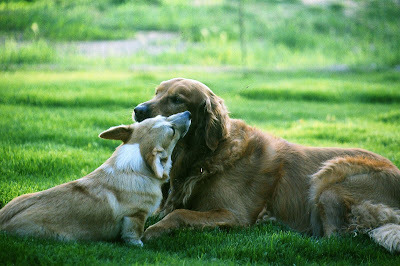 That is the hardest thing in owning a furry companion......maybe he will run into our big boy Hank over Rainbow Bridge. I am so sorry! When I saw his sweet face on my blog roll, I said a quick prayer that it wasn't a sad news. I know your grief. Oh, how I feel your pain. Rainbow Bridge shines it's colors even brighter now. Oh Karen! That is so so sad. I've had to do the same thing more than once and it never gets any easier, I know! But what would we do without them? Sorry you're so sad right now. I ALWAYS believe that they go to Heaven. I think that my animals are up there playing with my Dad who was a huge animal lover, just waiting until the day we see them again. Harley looking so handsome in his purple hat and tie for the party is how I will remember his sweet face. I'm so sorry. Sorry for your loss--it was a nice tribute that Harley deserved. I'm so sorry for your loss....pets own a piece of our hearts & Harley will surely be missed. What a beautiful tribute to him. Special blessings in this time of mourning. What a wonderful companion Harley was and what really great memories he has left behind. Blogging only happy things is actually what you have done... obviously this special animal made a fantastic impact on your family. I have lost several of my "best friends" and I have found a poem called the Rainbows Bridge helped me a lot. Thanks for sharing-- you are in my thoughts and prayers..
Ohhh, I wish our pets would last as long as we do. I am sorry to hear this, and know the loss you feel. Time helps. I like to believe when the pearly gates open all of our pets are there to greet us. My heart goes out to you and your family. I just came over from white linen and lavender fields and just love your blog, sugar! I'm in the Idaho southwest desert so I truly understand. I try to make my home as celestial and lovely/homey/inviting as possible also. I'd love to exchange links with you if you'd like. We're heading to the mountains today for a couple of days but I'd love to join in on the Places we create I read about on the blog that I came over from.......uuuuh, my old english teacher would cringe at this sentence! Nice meeting you, chickee. Drop over and visit when you get a chance. I am so sorry about your sweet boy. I just lost my little Chloe bunny two weeks ago. I know how your heart feels. I love the pictures. Especially the one of Harley & Jasmine running. No more seizures for either of them. Thanks for visiting me today!!! I am so sorry that I called you Marcela in the post. It is all fixed now!!! I think that I was thinking about what I was doing with ECS and Marcela there....and, oh, well...I'll just blame it on the summer heat here!!! LOLOL!!! Have a great 4th! Karen, I'm so sorry to hear about the lost of beloved pet. What a beautiful tribute to your family member...It's so hard sometimes, but look at the love he gave you and your family and the love he received in return. Your memories you will have forever! Big Hugs to you and your family. Oh, you've brought tears to my eyes. I'm so sorry to hear about your sweet Harley! It is so painful to lose a family member. I have to believe they are waiting for us and will greet us when we ourselves cross over. My thoughts are with you. May your sweet pup rest in peace in Doggie heaven. He looks like he was a true friend. What beautiful photos...brought tears to my eyes! I'm so sorry for your loss! Awww I just found your blog, and I do know what you are going through. I hope that you find peace in all of your beautiful memories. We lost our sweet girl Bootsie (kitty) 3 years ago, she was 16 years old. My husband and I were so heartbroken that 4 months later we brought home 3 kitties. To this day I still miss my Bootsie. Don't feel bad about sharing sad news...that's what friends are for...we take the good and the sad...I had to put down our American Eskimo six years ago...hardest thing I think I've ever had to do...hugs! I am so sorry to hear about the loss of your beloved Harley! Our beloved fur babies are angels sent down from above to bring us such joy, comfort and companionship. Harley was so blessed to be apart of your family. awwwww...I feel for you...we may be making the same decision soon...sigh! So sorry to read you lost your puppy...it is so hard to do that - I know. Blessings to you. I am so, so sad for your loss. My Pepper left me three years ago. 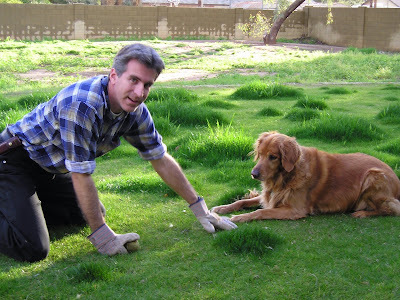 I planted a small garden in his memory, and ordered a custom steel sign in the shape of a dog with his name cut out. (http://gardendeva.com) Makes me feel good to go outside and see that dog shape bigger than he was sticking up to greet me. Hugs, blogging friend. I'm so sorry to hear about your Harley. What a sweet dog....they so become part of our families, don't they? 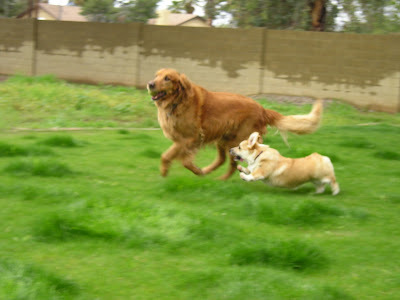 I'll bet even your little Corgie's going to miss him. We lost our German Shephard, Hans, to epilepsy not too long ago. I know how you must be feeling about the disorder and losing your precious Harley. We had Hans on medication for years and it was truly heartbreaking to watch him going through his spells. The disorder finally got the best of him and we ended up losing such a special member of our family. It hurts so bad, I know. He was 9 years old. Sending prayers and Blessings to you during this time. I, too, am sorry to hear about the loss of your boy. We have been there and done that, and even though it is the best for them, there is a hole in your heart. May you find something in the memories of him to fill that hole. I'll be thinking of you. I'm sorry you lost your dear Harley but thank you for posting pictures of him. I'm so sorry to hear about your Harley. 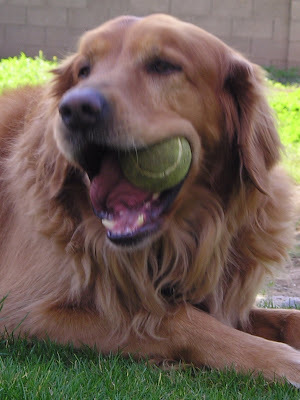 We had a Golden that we had to put down because of cancer. She was 12. She had the sweetest soul. She's been gone for over 5 years now, but I still miss her and think of her often. I hope you find peace. Oh. I never should have read that post. I'm so, so sorry y'all had to go through that. We get closer every day with one of our precious rescue dogs, my baby, my studio buddy, Ben, and reading your post about Harley was not only bittersweet but it tugged on my heart so strongly that I'm now a puddle. I am so sorry you lost such a wonderful pet. Harley was a wonderful addition to your family, and I am sure he will be missed greatly. The pictures you posted of him show such great memories - keep holding on to them and remember him as the friend he was. Please know I am thinking of you and your family.